Shifty and light winds challenged the teams once more on day two of Match Race Germany in Langenargen. After 48 of 66 matches in Qualifying, Eric Monnin's Team SailBox from Switzerland and Tomislav Basics' TB Race Team from Croatia lead the rankings with seven wins each and only one loss. Six flights remain in the qualifying rounds. Interestingly Monnin lost his match against Basic which could become a deciding factor in case both teams can defend their joint lead till the end of the Round Robin as only the top team moves straight into the semi finals whilst the next six teams reach the quarter finals in this German World Championship Run of the World Match Racing Tour. Holding third position is Poland's Przemyslaw Tarnacki following a solid day on the water for his newly branded Energa Yacht Racing Team. 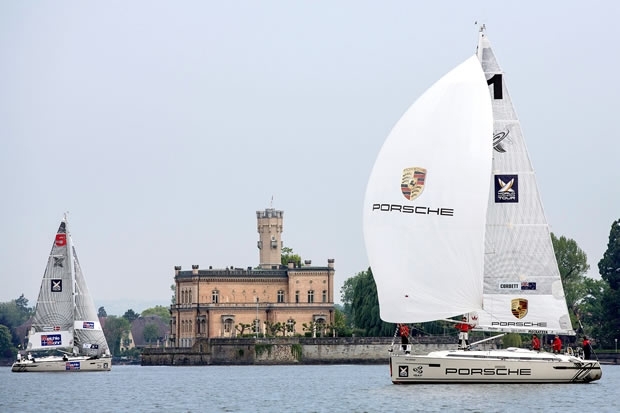 After a week sailing the Catalina 37 yachts at the Congressional Cup in California, Tarnacki and his crew have had to adapt quickly to the heavier Bavaria 40 match racing yachts on Lake Constance.